USPA NEWS - The Forth Bridge was made with approximately 54000 tonnes of steel and 6.5 million rivets. 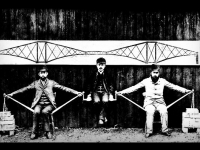 The Forth Bridge is 1.6 miles (2.5km) long. The bridge has a speed limit of 50 MPH (80 km/h) for passenger trains and 20 MPH (32 km/h) for freight trains. 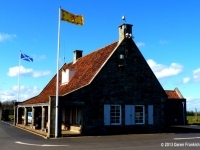 USPA NEWS - Decommissioned in 1992 Troywood, Scotland's secret bunker lies 3 miles North of Anstruther, Fife. Now a major tourist attraction Scotland's secret bunker is a cold war time capsule. When you visit the secret bunker you will find a disguised red tiled farmhouse inconspicuous in it's surroundings. 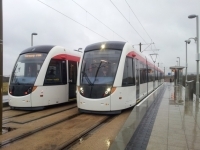 USPA NEWS - Testing has started and the official launch date for Edinburgh’s entire tramway is likely to be revealed in September 2013. The tram is proposed to operate every 10 minutes, with a journey time of "approximately 30 minutes from Haymarket to Edinburgh airport"
USPA NEWS - Britannia will celebrate a very special 60th anniversary in 2013. 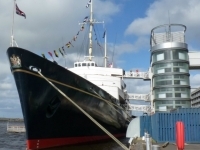 On 16 April, 1953, Britannia was launched from the John Brown & Company shipyard in Clydebank - Scotland, the start of long and illustrious career. Britannia has very special plans throughout the year to mark this occasion.